Southampton fell to a crushing 2-1 defeat at home to Premier League relegation rivals Cardiff City at St Mary’s on Saturday, and manager Ralph Hasenhuttl’s team selection was certainly questionable considering his team ultimately needed to take the game to their opponents. When the team-sheet was announced it seemed as though he was going to stick with the 3-5-1-1/3-5-2 formation that he had largely preferred in recent weeks, but the early signs after kick-off suggested centre-back Jack Stephens was actually going to push forward and play more of a defensive midfield role. However, the 25-year-old quickly reverted back into his natural position as the first half went on, with Oriol Romeu, Pierre-Emile Hojbjerg and James Ward-Prowse providing the protection ahead of the trio of central defenders. While the Bluebirds may have come out on top in the end, in truth they rarely threatened from an attacking point of view until they took the lead in the 69th minute, and there left plenty of gaps to be exploited in-between the lines. 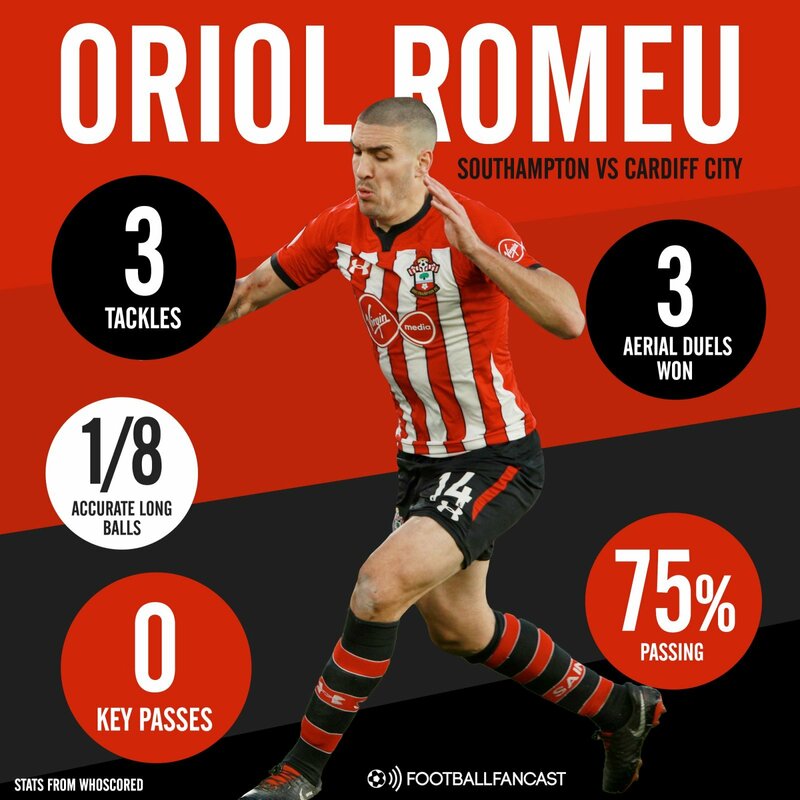 With little to do from a defensive point of view, Romeu was often the extra man over in the middle of the park when his team was attacking, but while he may be good at winning his fair share of tackles and aerial duels – he won three of each against Neil Warnock’s men – he proved that he doesn’t have the ability to drive forward and find those passes that can help the likes of Nathan Redmond thrive. This was shown with his accuracy in possession of 75%, while he failed to make a single key pass and was successful with only one of the eight long balls he attempted. There appears to be little doubt that the hosts could have coped with just Ward-Prowse and Hojbjerg as their protecting midfielders if they are playing three centre-backs in future at home against one of the teams around them, and manager Ralph Hasenhuttl needs to realise this now with the visit of Fulham to come at the end of the month. While the 27-year-old Spaniard can he hugely useful on the road or at home against the bigger Premier League sides, he is essentially useless when Southampton face a team that put players behind the ball, and the Austrian manager cannot afford to make the same mistake again as he bids to keep the club in the top flight.